Been to the Transformers section of your local Wal-Mart lately? If so you may have been pleasantly surprised to see that Deluxes have been rolled back to $9.96! Seibertron member reluctantyouth dropped by with the images below from Bloomington, Illinois. The tag lists Generations Deluxes, however I can confirm that Transformers Prime Beast Hunters Deluxes have also been rolled back. At least that's the case for my local Wal-Mart in central Oklahoma. 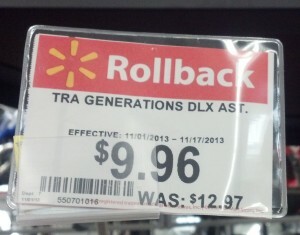 Definitely a little late, but the Rollback could extend beyond the time frame listed on the tag, depending on the store. But hey, you've all got still got a hew hours to take advantage! You do realize this is likely in anticipation of the switchover to those awful Legion scale-ups they're doing, right? And also only likely to last until AoE comes out. Or at least that's what my pessimistic view is. I got Orion Pax on this rollback. Never planned to, but for that price I figured 'what the hell?' Now I just need to figure out who to repaint it into. this has been going on for the past 2 weeks at the walmarts i go to. But does me no good cause its all just wave 1 beast hunter crap. Neither store has had anything new in months. Nemesis Maximo wrote: I got Orion Pax on this rollback. Never planned to, but for that price I figured 'what the hell?' Now I just need to figure out who to repaint it into. Same here, but my goal is figuring out how to build the trailer he was hauling Rack and Ruin in. been on going online too.. got mine online for the same price since half the time i cant find it at thelocal walmart..
That's the price they need to stay at and maybe I would actually BUY them all instead of waiting for sales and only get a couple. Megatron Wolf wrote: this has been going on for the past 2 weeks at the walmarts i go to. But does me no good cause its all just wave 1 beast hunter crap. Neither store has had anything new in months. Same here. Probably discounted cuz they can't move the same toys that have been peg warming. They should export all of them to the Netherlands here because we never got Waves 1 and 2, we skipped right to Wave 3. The only wave 1 figures we have are Bumblebee and Wheeljack because they shipped in later waves. Saw the sale today In Fredonia Ny. Would have been nice if they had more than 3 Beast Hunters on 4 pegs. 2 opened Starscreams and one not opened. Might have been one generation but it looked horrid. They're being rolled back! ... To their original prices before Hasbro decided they want more money...? #Sideways# wrote: They're being rolled back! ... To their original prices before Hasbro the stores decided they want more money...? Seriously tho, Rollbacks are temporary, and only serve to clear stock, so stores can justify ordering more, and thus earn more money. Simple economics. #Sideways# wrote: They're being rolled back! ... To the lowest price they've ever been in history when you account for inflation! It's great that Hasbro can still make a profit at such low prices, since they're not running a charity and the only reason they can continue to make TFs is because of those profits. This would hold true if not for the noticeable decrease in size and quality over the last few years. I and others are loathe to pay the same amount (accounting for inflation) for smaller, simpler, and weaker figures. This isn't to say that all figures in the last few years have been awful; it's just that on average they don't seem as good as what we had some years ago. My Walmart rarely has any good figures in stock. If you're like me and buy most of your figures online, Amazon has most of the Generations deluxe figures for $9.00 right now. The $9 figs include: Trailcutter, Hoist, Orion Pax, Bumblebee, Megatron and Thundercracker.